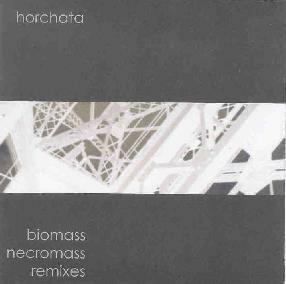 Horchata - "Biomass: Necromass Remixes"
A cool Mexican rice-based desert is perfect for the lazy, blazing days of mid-summer. Much like its tasty counterpart, the eponymous Horchata is a blend of slow, hypnotic beats, processed guitars — invoking visions of cool, subterranean streams and deliver a satisfying, but vaguely ominous beverage right to your door. Twine (an Ohio duo) take on Necromass as mezmerizing darkhop, finally concluding in a dreamy haze of electronica, digital stumming, and samples of female chanting..
Ocosi (Pual Molyneux) grinds into Biomass, introduces deconstructed fading beats and keyboard flourishes, processed baritones..